I’ve gone back and forth about doing this post because, while so many authors use twitter, it isn’t integral to the publishing business. 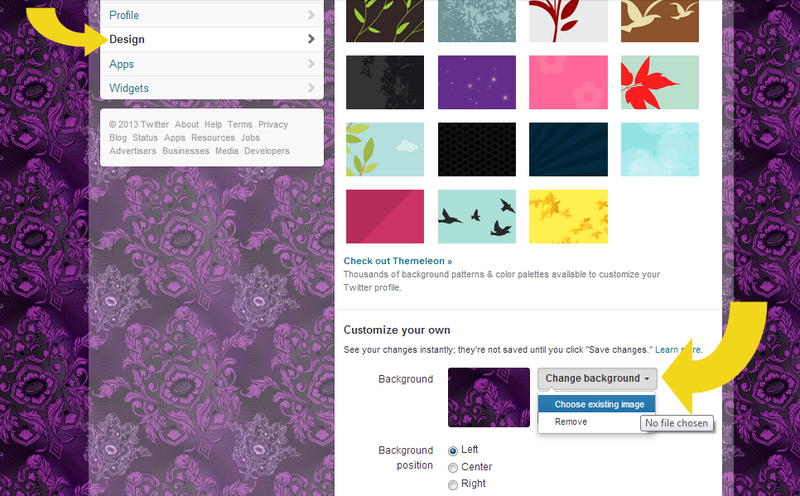 But, after having to explain how to set wallpaper to yet another person via email, I decided there was a need for it. 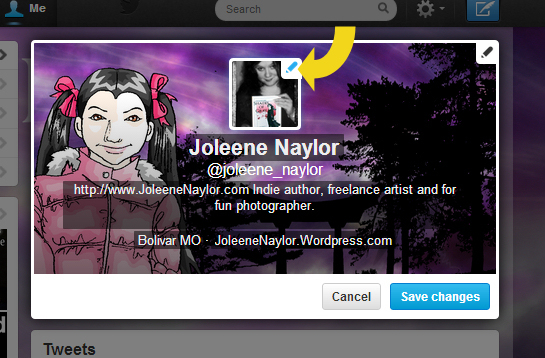 Near the upper right corner of your profile is a little gear icon. 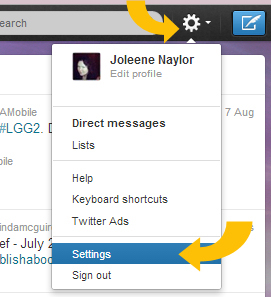 Click it and a drop down box will appear that allows you to access several things. The only thing we’re worried about is the settings option. 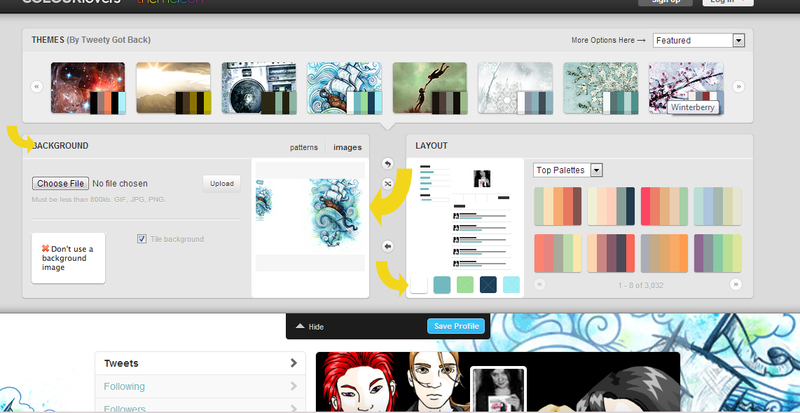 A new screen will load and you’ll want to click on “design” in the left hand pane. This will change the options on the right side, and you’ll be greeted by several default thumbnails. 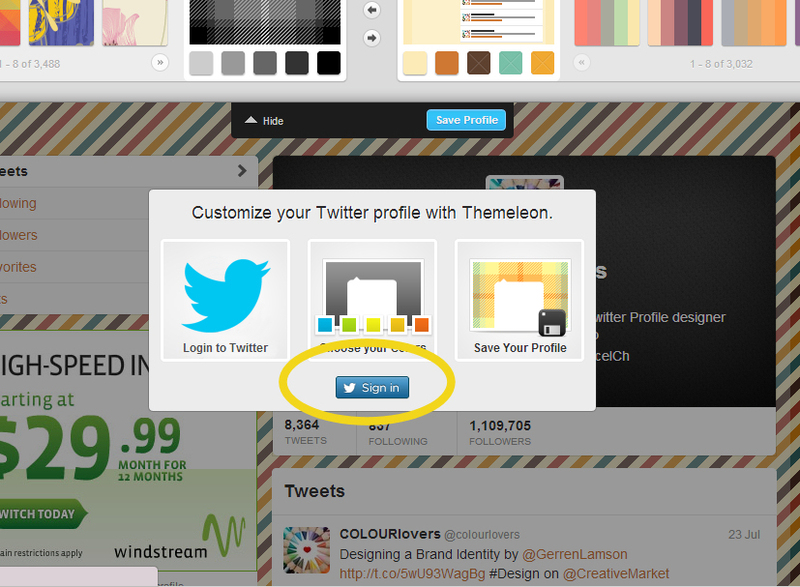 If you want, you can use any one of these, or you can try the interesting plugin called Themeleon. You may or may not have to sign in again (I did, but this may be because I took so long taking screen caps etc.) 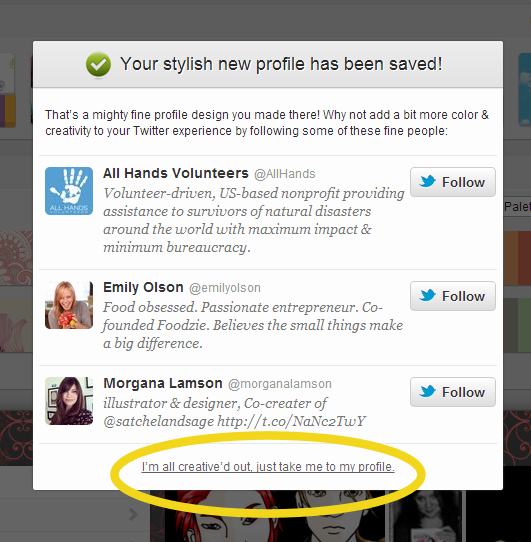 But you will eventually come to your profile editing screen. At the top are some pre-made themes (more on those in a moment) and in the second half of the toolbox are the “make your own theme” tools. 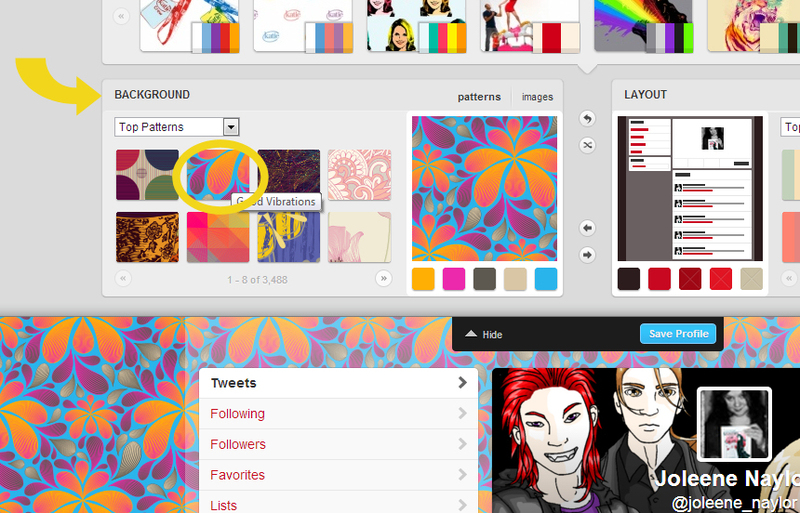 As you can see it starts with a background pattern, which you can scroll through. What’s the difference between the pre-made and the DIY? Unlike the do it yourself set, the theme’s wallpaper tends to be a single large image, like more traditional wallpaper, instead of a tiled pattern. 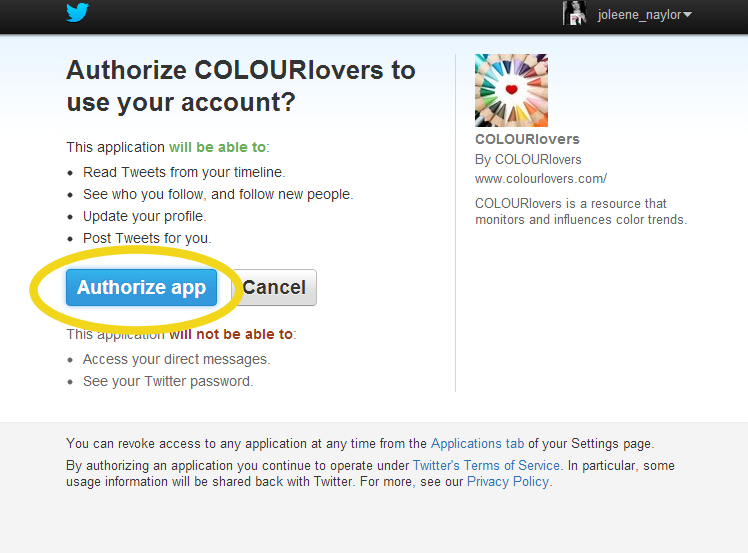 You can also upload your own image, if you prefer, but it’s easier to do that through twitter itself. 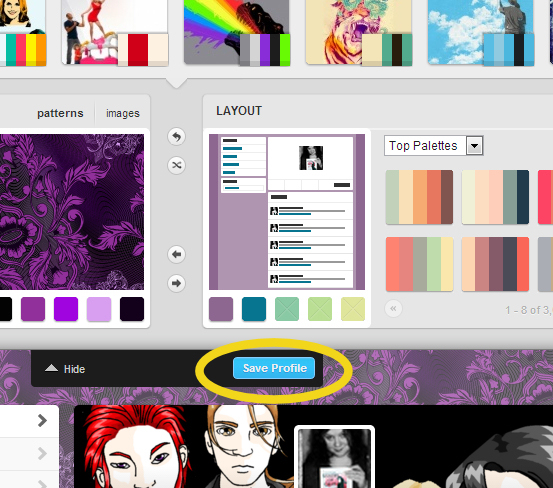 As you’ll notice when you click on the themes you get a preview, not only in the toolbox, but if you scroll down your profile also “tries it on” so you can see how it’s going to look. 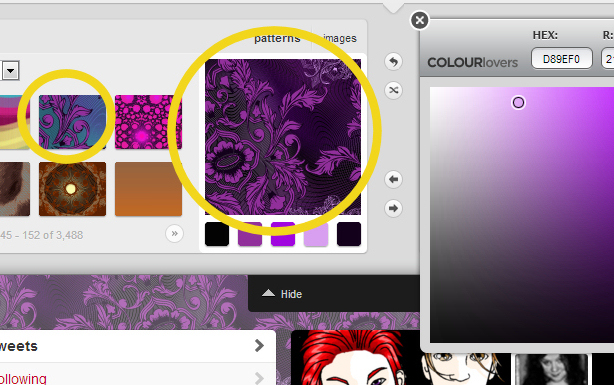 If you’d rather start from a pattern, go down to the background option. There’s a drop down box with choices but I’ve never bothered with it and usually just scroll through the available backgrounds by using that little arrow button we mentioned earlier. Don’t let the colors fool you – you can completely change them. For instance you can see that the pattern above looks very tropical, but with a few color swaps it now looks… well, the colors are different, anyway. How did I do that? Underneath the pattern preview are colored boxes, each representing a color in the pattern. 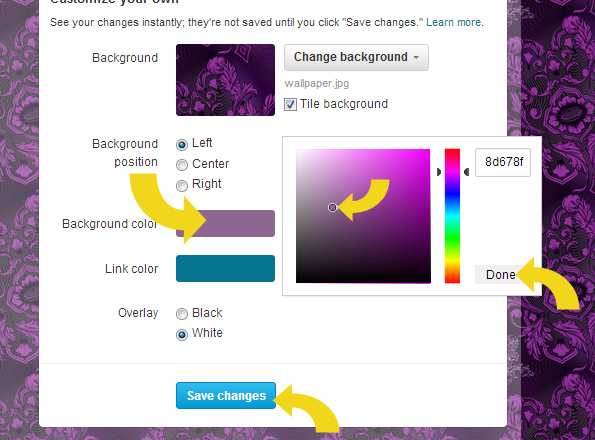 Click the color you’d like to change and you’ll get a snazzy pop up. 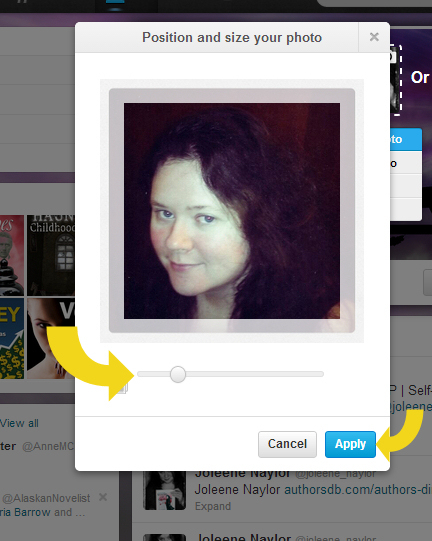 Move the circle around on the color chart, as well as the sliders, to change the color to something you like better. 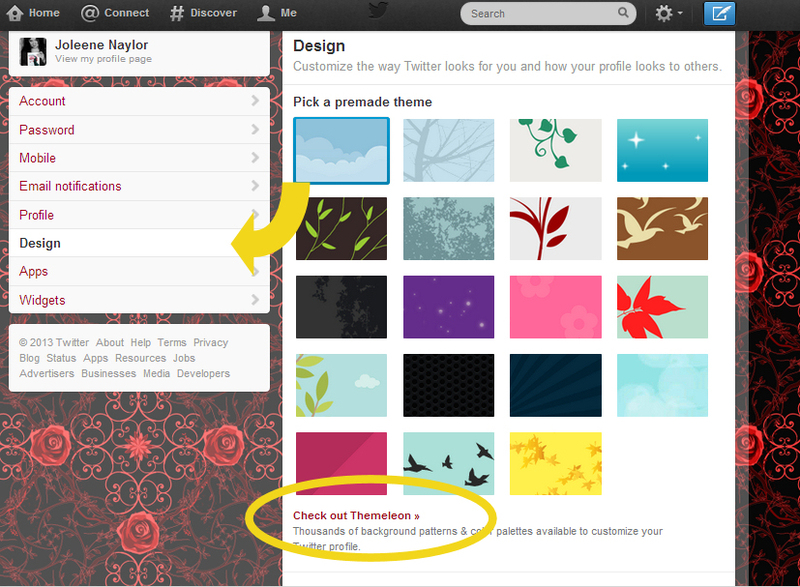 Once you have a pattern you like, it’s time to tweak your layout. 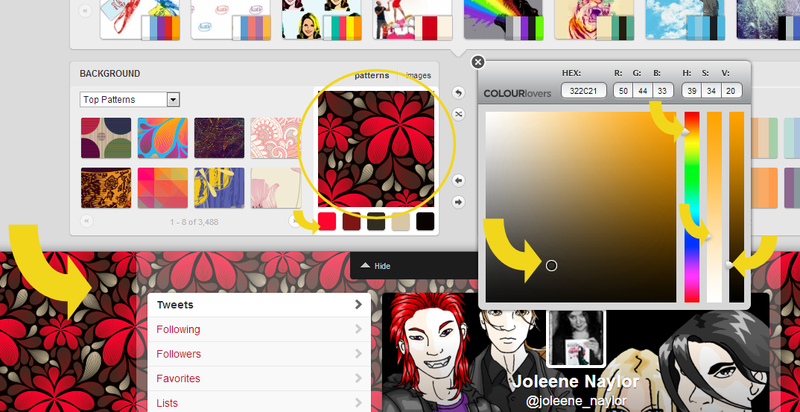 There are several pre-created palettes you can choose from by using the arrow key. 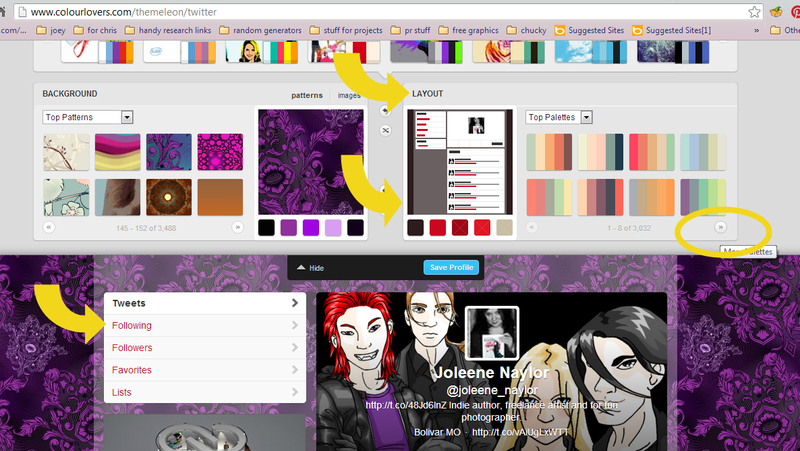 The colors you are choosing now change the color of your links, such as where it says “Following, Followers” etc. 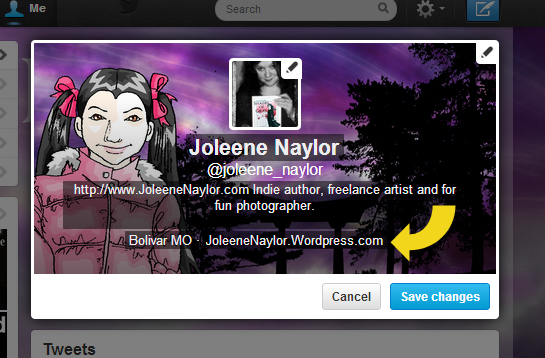 as well as links in your twitter stream. if you don’t like the pre-made palettes you can make your own. 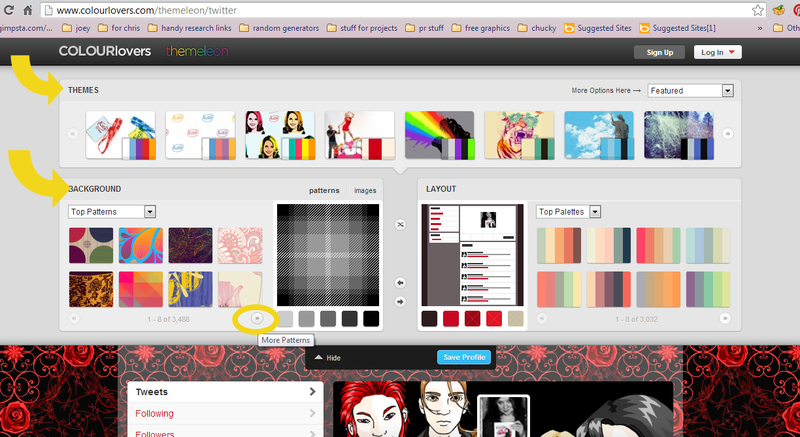 Click on the colored squares to get a pop up color picker. Move the circle and the sliders until you find the colors you want. You’ll get a pop up trying to encourage you to add more things, but just click the “I’m all Creatived out” button to skip it. 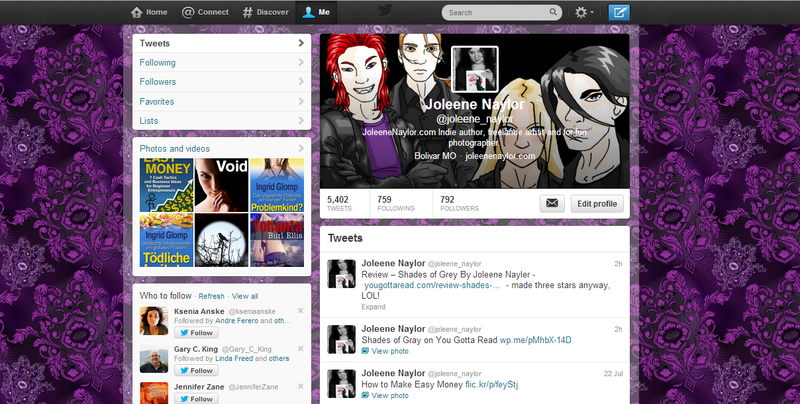 And now bask in the glory of your new profile! 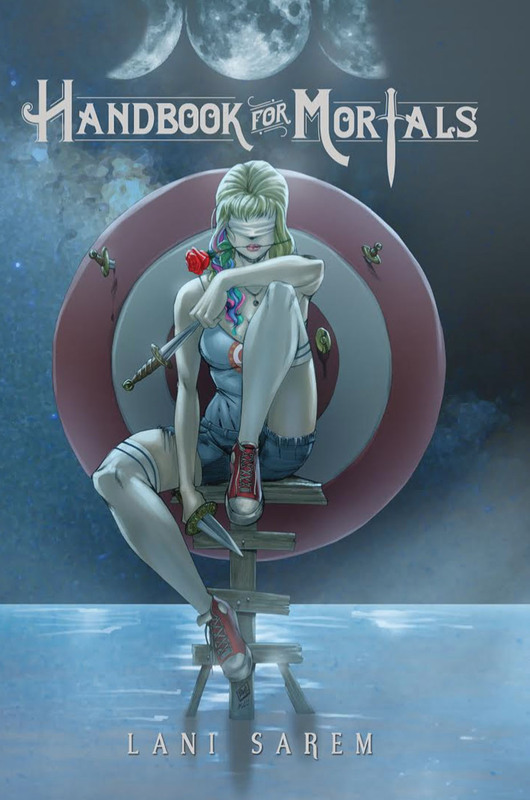 if you have your own wallpaper – maybe it’s your book cover, or your characters, or just a snazzy photo – then it is really easy to upload it to twitter. You’ll get a pop up. 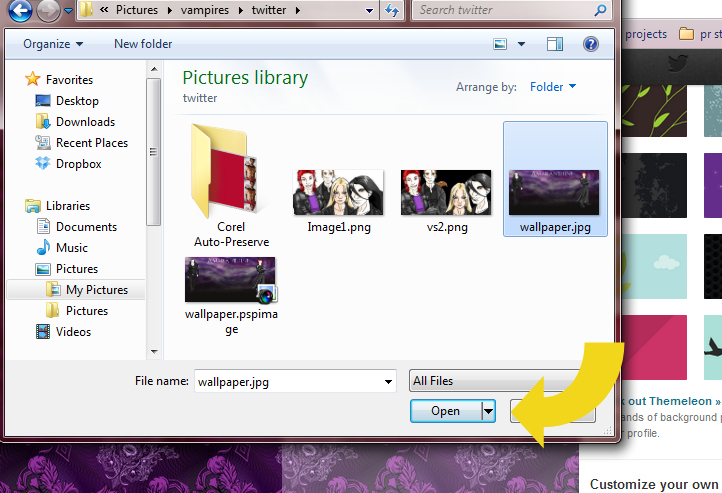 Navigate to the folder that your wallpaper is saved in, click on it and choose open. Jpegs work better than pngs. 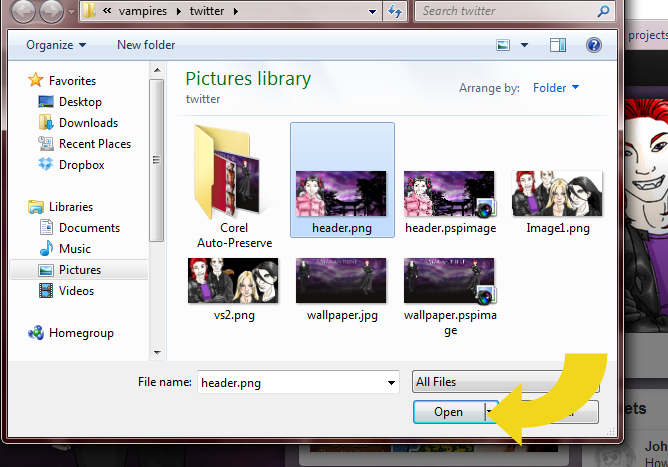 If the wallpaper file is “acceptable” the words under the “Change background” button will reflect the file name. Then it’s time to set where the wallpaper goes. you can have it left aligned – meaning it is “sticky” on the left side, so that the left side of the image will always be on the left side of the screen – centered, and right aligned (which does the same as the left but on the right). You can also choose whether to tile your image or not – play around with the options until you become familiar with the differences. 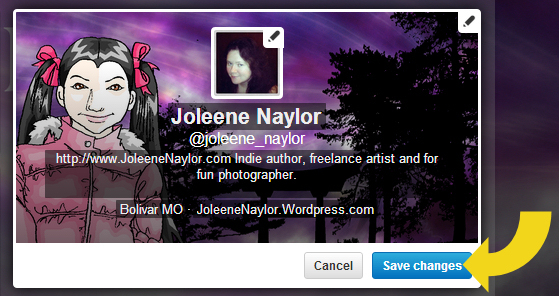 Though unlike themeleon, your profile will NOT reflect changes until you save it. 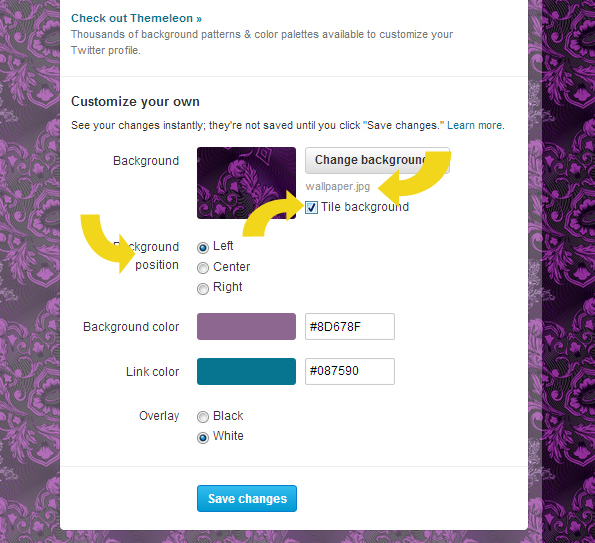 As with Themeleon, you can change your link colors and your background color. 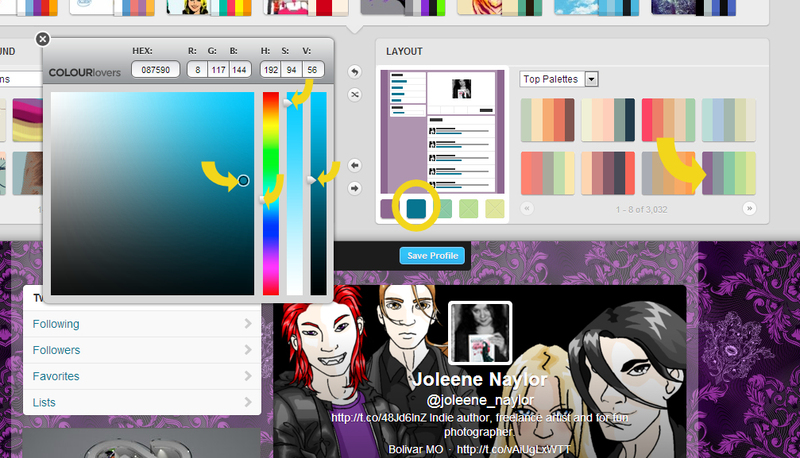 Click on the colors to get the pop up color picker. When you’re done, hit “Save Changes”. and check out your new profile! 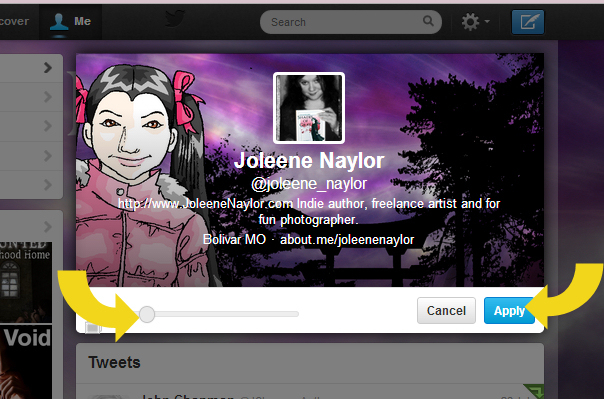 On your profile page click the Edit Profile button that is just below your “banner area” – if you have no image here it will be a black-ish box. Hover over it and a little pencil will appear in the top right corner. Click on it. 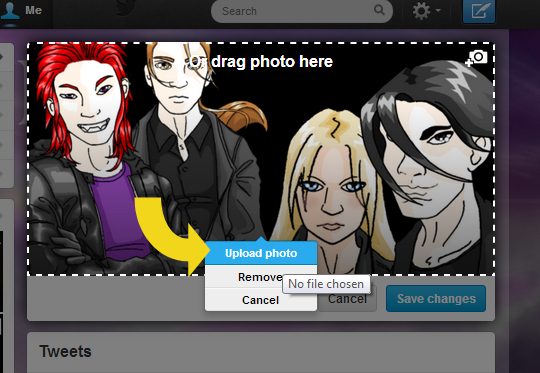 A little box will pop up that lets you upload a photo, remove your photo or cancel. We want to upload. You’ll get another pop up. 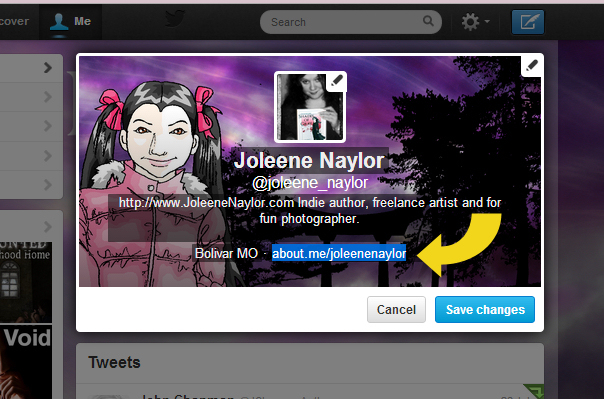 Navigate to your banner image and choose “open”. While we’re there, let’s edit our profile information. 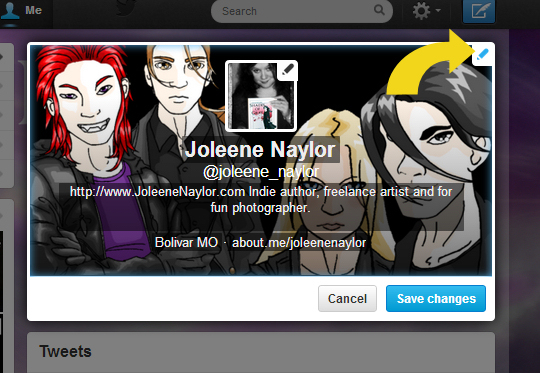 If you’re starting here, then click on the “Edit Profile” button underneath your banner image. While we’re there, let’s edit our profile photo. 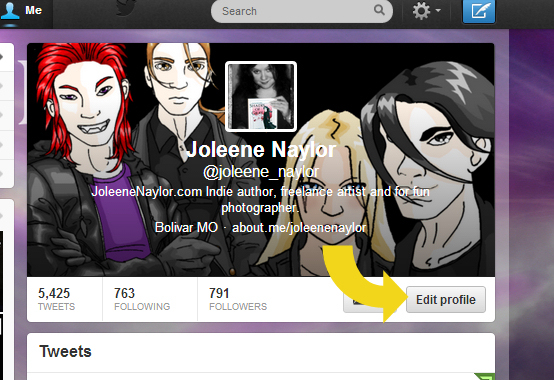 If you’re starting here, then click on the “Edit Profile” button underneath your banner image. If you hover over your photo you’ll get a little pencil in the top right corner. Click it. 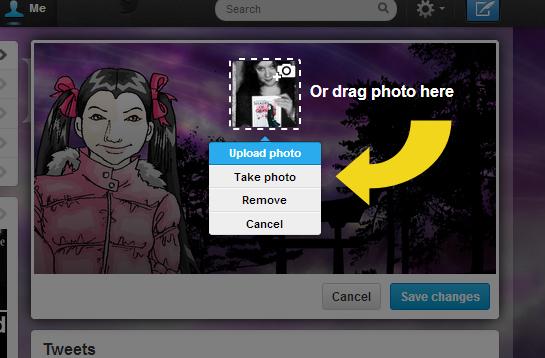 A little menu will pop down with the choices to upload a photo, take a photo, remove photo or cancel. For this tutorial we want to upload, though if you have a webcam and a good hair day you might try the “take photo” option and let me know how it goes. Clicking upload gets you a pop up box. 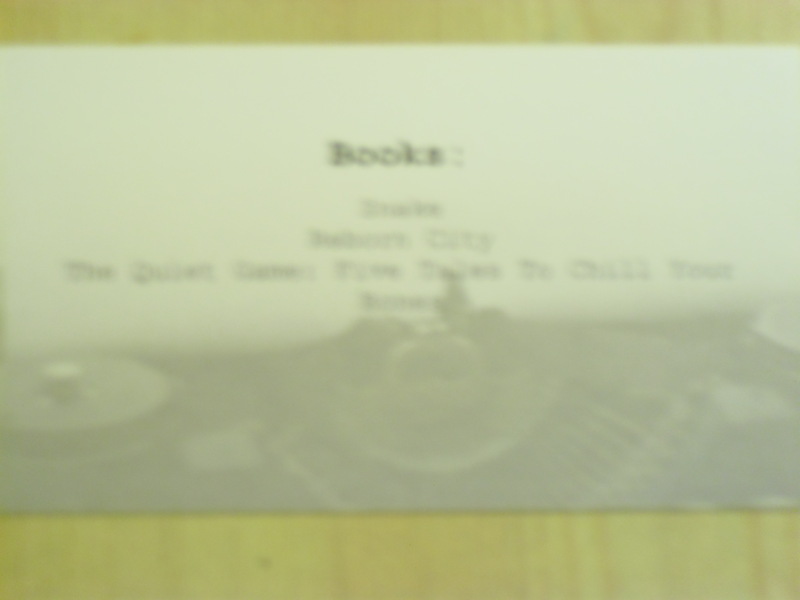 Use it to navigate to your photo and click open. 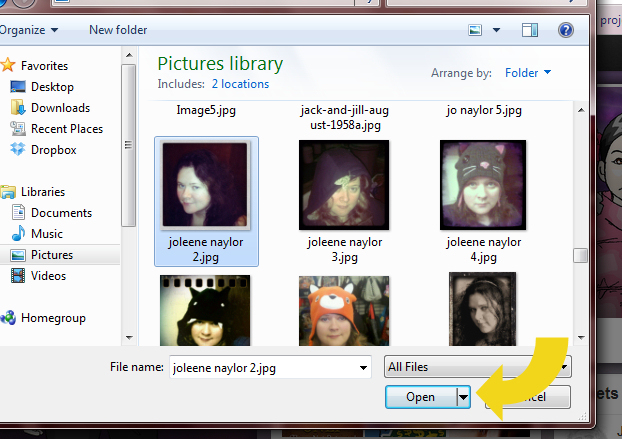 A new box pops up that has your photo of choice with a slider bar underneath. You can drag it to zoom in closer to the image, essentially cropping it down. When you have what you want, hit apply. If you’re all finished make sure to hit the Save Changes button. While browsing my Twitter stream this morning I found this great article by Daniel Sharkov. He gives a beautiful example, goes more in depth, and says it so much better than I did or could in Creating Schedules and Routines to Enhance your Writing. Daniel Sharkov writes, “Back in the closing months of 2011, before taking a huge blogging break, I was used to working a lot. I was spending long hours, trying to improve my blog’s performance. 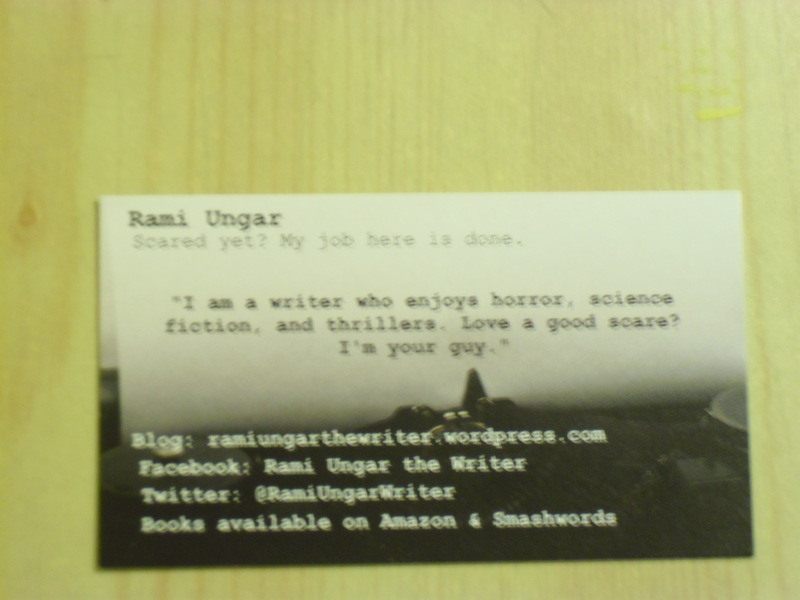 I was publishing long in-depth posts so writing and research alone were taking two-three hours every day. Twitter and all of the tools that go with it were also draining valuable time. “All of this was partially the reason for me to stop blogging for almost four months. In the end I learned that spending your day on something and actually making progress are two different things.